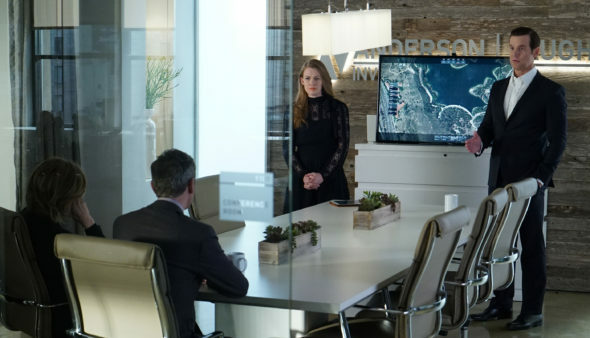 Are Alice and Ben still playing their cat and mouse game in season two of ABC’s The Catch TV show? As we know, the Nielsen ratings typically play a big role in whether the TV show The Catch is cancelled or renewed for a third season. Unfortunately, most of us do not live in a Nielsen household. Because of that, many viewers are frustrated their viewing habits and opinions weren’t considered, before ABC cancelled The Catch after two seasons. We care what you think, so we are offering you the chance to rate all the second season episodes of The Catch, below. The Catch stars Mireille Enos, Peter Krause, Jay Hayden, Jacky Ido, Rose Rollins, Sonya Walger, Elvy Yost, and John Simm. Gina Torres and T.R. Knight recur in the second installment. The ABC TV series centers on private investigator Alice Vaughan (Enos) and the man she loves, elusive con artist Benjamin Jones (Krause). Season two began with Ben having repented for betraying Alice by turning himself into the Feds, to save her from wrongful imprisonment. Locked up, he has time to reflect on his transgressions. To stay together and overcome their dicey histories, these two will need to find a new way to game the system. What do you think? Which season two episodes of The Catch TV series do you rate as wonderful, terrible, or somewhere between? Was ABC right to cancel this TV show, or should they have renewed it for a third season? Don’t forget to vote, and share your thoughts, below.